An Iranian-backed terrorist known as the “Shiite Zarqawi” is reported to have returned to Baghdad to carry out attacks in central and southern Iraq. Abu Dura, the notorious former Mahdi Army commander whose group was behind the butchering and execution thousands of Sunnis in the capital during the height of the violence in Iraq, is said to lead a unit of the Asaib al Haq, or the League of the Righteous, in Sadr City. Abu Dura is said to have sheltered in Iran for the past two years, where he has been aided by Iran’s Revolutionary Guards Corps. “Our strategic information indicates that he stayed in the city of Qom and that he received further training at the hands of the Iranian Revolutionary Guards to carry out terrorist attacks against the Iraqi and US forces, and Sunni civilians,” an Iraqi intelligence official told Asharq Al Awsat. Muqtada al Sadr, the leader of the Mahdi Army, also shelters in the city of Qom in Iran. The US Forces – Iraq is aware of the report, a US military intelligence official who tracks the Shia terror groups told The Long War Journal. Abu Dura’s return to Iraq was partially responsible for causing General Ray Odierno to sound the alert that Iran is seeking to reignite the Shia terror insurgency. Abu Dura, whose real name is Ismail Hafiz al Lami, served in Saddam Hussein’s army up until 2000, when he deserted. He joined the Mahdi Army after the US invasion of Iraq in 2003 , and quickly rose through the ranks by running criminal enterprise, extortion, kidnapping, and assassination rings, and by slaughtering Sunnis in Baghdad. Abu Dura was known to use a power drill to torture and kill his victims. His excessive brutality earned him the comparison to Abu Musab al Zarqawi, the sadistic leader of al Qaeda in Iraq. In January 2008, the US Treasury, under Executive Order 13438, added Abu Dura to its list of individuals who aid the Iraqi insurgency. Abu Dura was added along with Ahmad Foruzandeh, the former commander of the Iranian Islamic Revolutionary Guard Corps-Qods Force, and Abu Mustafa al Sheibani, the leader of the Sheibani network, one of many Shia terror groups backed by Iran. 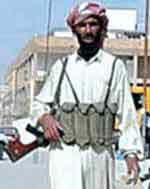 In September 2008, the US Treasury added Akram Abbas al Kabi to its list of individuals who aid the Iraqi insurgency. Kabi is the current leader of the League of the Righteous. He was added along with Abdul Reza Shahlai, a deputy commander in Iran’s Qods Force who backed Shia terror groups. Shahlai was involved in the planning and execution of the Jan. 20, 2007, attack on the Karbala Joint Provincial Coordination Center. Five US soldiers were kidnapped and then murdered during the sophisticated attack. The Iranian-backed kidnappers were believed to be heading toward Iran when Iraqi police caught up to them. Abu Dura’s return to Iraq and rejoining the League of the Righteous caps off a year of failed US attempts to promote reconciliation with the Shia terror group. In July 2009, the US freed Laith Qazali; more than 100 other members of the League; and five Iranian Qods Force officers, including Mahmud Farhadi, the leader of the Zafr Command, one of three units subordinate to the Qods Force’s Ramazan Corps, the unit designated to carry out attacks in Iraq. Laith is the brother of Qais Qazali, the founder of the League of the Righteous. Qais was Muqtada al Sadr’s top aide and spokesman. Qais was behind the kidnapping and murder of five US soldiers in Karbala in January 2007 and numerous other acts of terrorism before he was captured by US forces in March 2007. Qais was released in late December 2009, purportedly as part of a reconciliation process. But his release came at the same time that a British contractor, who had been captured by the League of the Righteous in May of 2007, was turned over to the British. The Shia terror group previously executed four other British contractors who had also been held hostage. The skepticism quickly proved to be well placed. The League of the Righteous backtracked on reconciliation, and suspended talks with the Iraqi government in early January 2010, just weeks after Qais’ release. And in mid-January, the League of the Righteous kidnapped Issa T. Salomi, a US Defense Department contractor, in Baghdad. Salomi was freed in late March, purportedly as part of yet another prisoner swap. The US military denied that such a swap had been made, however. The League of the Righteous still holds one US citizen hostage: Sergeant Ahmed Altaie, who was kidnapped in Baghdad in 2006. Altaie’s status is unknown, but it is thought that he died in captivity. The League of the Righteous claimed it recovered Altaie’s remains from another insurgent group. A group called the Ahel al Beit Brigades claimed to have kidnapped Altaie in 2007. The US military would not officially comment on inquiries on Altaie or the Ahel al Beit Brigades. But a US intelligence official told The Long War Journal that the Ahel al Beit Brigades is part of the League of the Righteous. For more information on Iran’s support of Shia terror groups in Iraq, see Iranian-backed Shia terror group remains a threat in Iraq: General Odierno and Iran’s Ramazan Corps and the ratlines into Iraq. • Iraq: Notorious Shiite Warlord Returns to Baghdad, Asharq Al Awsat. His bio reads like he’s a mercantile terrorist. If Hollywood ever shoots ‘Badfellas’ the movie his persona just has to be in it. Once he gets going, you’d think the other criminal enterprises would finger him: he’s WAY too much competition! They waited till the date we told them it was safe to come back and resume their terror on the Iraqi people. I have to wonder how long until Al Sadr returns…. it was his followers who killed my son with Iranian help. We aren’t done in Iraq. its just a matter of time and another generation who will have to go back and finish what we failed to. The clock is ticking on this psycho. Once he returns to the “kill zone” (Iraq) it’s only a matter of time until special ops punches his time card. Welcome back to Iraq Abu. Power drills? This pervert needs to be liquidated post haste. Man, this Administration’s “outreach” to the Mad Mullahs of Tehran sure is working wonders. More hope than change. You damn right it was! Frankly, it was the single stupidest thing Dave has done to date, regardless of pressure from State. Bungo, We know exactly where these jokers spend thier time. We’ve had the data on those still inside Iraq for some time, yet those who’ve never dealt with these monsters face to face insist on the “reconciliation” COA. Their is no reconciliation for these folks. Soldiers used incredible restraint to bring these folks to justice above board only to have them freed like some kind of retarded “invasive species catch and release” policy. Sorry to hear it Angelia. God Bless you and your Son. PS. I think the US has done a lot of good in Iraq. Its better for it. I doubt another invasion will be necessary. Please keep your false partisan attack politics away from this blog. This blog fails when it or its readers engage in such unfounded political attacks. I’m afraid you’re right that we are not finished in Iraq, but I hope it’s not the case. Clearly the aptitude of the security forces has come a long way, and if they can put together consistently reliable leadership, the country may yet be able to stand as an example in the region. But the inability of the competing factions to form a functioning governing majority is very disheartening. @Mike: Sorry, pal, people in positions of political power require scrutiny and accountability. That happens to be “This Administration”. Who has been managing the Iraq operation this past 17 months, the last Administration? If I offended your delicate political sensibilities, too bad. If Bill wishes to censor my comments because of an overly partisan agenda that’s his prerogative and I’ll understand. I try not to interject that agenda in this fourm. But make no mistake: I don’t run my opinions or analysis through you. Thanks in advance.